A Mail Transfer Agent (MTA) is a software that transfers electronic mail messages from one computer to another using a client server application architecture. An MTA is also called by a few other names such as - a Message Transfer Agent, Mail Relay, and Mail Transport Agent. Some of the popular MTAs in use are Sendmail, Exim, and Postfix. 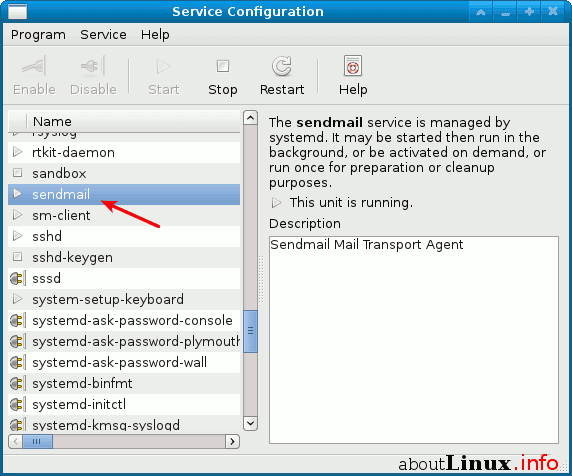 Fedora and Red Hat Linux distributions by default ship with Sendmail as their MTA. However, switching to another MTA such as Exim or Postfix is quite easy. In Fedora or Red Hat, you can change the default MTA by using the alternatives command. Another method of changing your default MTA in Fedora is to use the /usr/sbin/system-switch-mail or /usr/sbin/system-switch-mail-nox tool. You will first have to install the system-switch-mail package using Yum as follows. Once you have installed the system-switch-mail package, you can run one of the corresponding tools to switch between the different MTAs installed in your system. When you run the system-switch-mail[-nox] command, you will see a self-explanatory selection dialog that allows you to switch to another MTA installed in your system. To verify that the MTA of your choice has started running, open system-config-services in Fedora and see if it lists your MTA in the services that are running on your system.